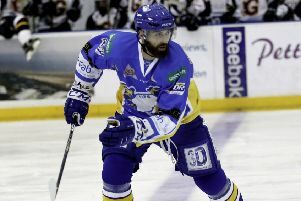 Mike Cazzola has only been a Fife Flyer for a few weeks, but he has seen enough to know that he wants to stay with the club for more than one season. The 27-year-old Canadian is back enjoying his hockey again after enduring a turbulent year with Edinburgh Capitals, so much so that he already eyeing a long-term future in Kirkcaldy. “It’s nice and refreshing,” Cazzola told the Press. “I’m coming to the rink and having fun again and it’s been a full year since that happened. “Every time I get on the ice I’m a little bit more appreciative now of how quick it can slip past. Cazzola is combining his hockey with a Masters degree in physiotherapy at Queen Margaret University, which helped him escape from the troubles at Capitals last season. “It was tough, but I went to Edinburgh on a two-year contract and I wanted to show the fans I was loyal and wasn’t going to leave halfway through,” he said. “I wanted to show my commitment so I would have stayed, but things didn’t work out, I’ve moved on with Fife, and now I want to prove to the fans here that I’ll be here for a long time. “I don’t want to be here for one season and move on. Cazzola admitted that it is strange not seeing his former club in the EIHL this season following their failure to secure ice time at Murrayfield. “I think it will sink in once we’re a quarter of the way through and we haven’t played in that rink,” he said. “I think the fans in Edinburgh deserve the team to make a comeback. Cazzola was speaking after making his mark on the opening weekend of the season with the dramatic game-tying goal in the final second of Saturday’s third period against Glasgow Clan. Fife went on to claim a 5-4 victory on penalty shots, and Cazolla was left enthralled by his first taste of the rivalry between the clubs. “It was amazing,” he said. “They told me it would be loud, but I didn’t realise it would be that loud. It was a nice way for us to tie it up in the last second of the game. Flyers failed to replicate their form on Sunday as they were second best to a Belfast Giants side which claimed a fully deserved 3-1 victory. “We just got away from the game plan,” Cazzola admitted. “In the first and second periods against Glasgow we were chipping pucks in, and gaining possession in their zone. “Against Belfast we struggled to do that. We were trying to chip pucks in and they were breaking out straight away. “We weren’t putting them under enough pressure or getting enough zone time on offence, so it ruined the flow of our game and our identity. “We tried getting back to it in the third period, but we can’t rely on these comebacks every game.